1. 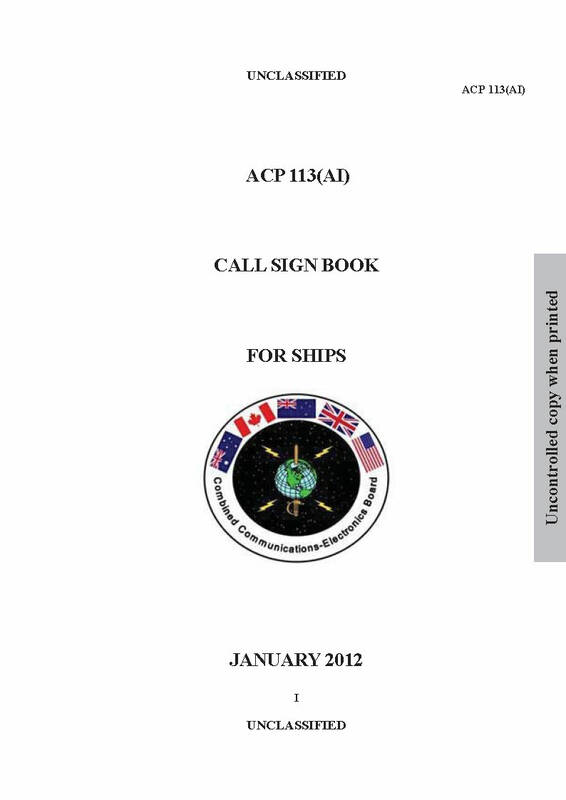 ACP 113(AI), CALL SIGN BOOK FOR SHIPS, is an UNCLASSIFIED publication. Periodic accounting is not required. 2. ACP 113(AI) will be effective for National, Service, or Allied use when directed by the appropriate Implementing Agency and, when effective, will supersede ACP 113(AH) which is to be destroyed in accordance with current security regulations. 3. This publication now incorporates as ANNEX B, the information formerly contained in ACP 130 NATO SUPP-1 Section 2: Decoding of Visual Callsigns (pennant numbers) allocated to Ships and Certain Aurtorities of European NATO Countires and of the Countires of the British Commonwealth of Nations (Excluding Canada). 7. This ACP is to be maintained in accordance with provisions of the current version of ACP 198. Хорошая, довольно-таки познавательная книжка. А как часто она пере издается, с какой периодичностью в нее вносятся изменения?